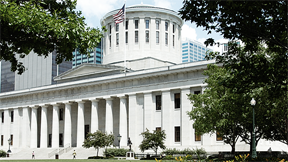 The Ohio Statehouse will reinstall and rededicate the General Benjamin Oliver Davis, Jr. portrait as part of a special Black History Month celebration. The painting will be permanently placed on public view outside the George Washington Williams Room. The reinstallation will honor General Davis and every Tuskegee Airman who honored our country with their patriotism and courage during World War II. The first Tuskegee Airmen class in 1941 included Benjamin O. Davis, Jr. who later rose to become the country's first black general. Gen. Davis was born in Washington, D.C., in 1912. Davis' family moved to Ohio where he graduated from Central High School in Cleveland in 1929, and later attended Western Reserve University in Cleveland.The Tuskegee Airmen were part of a U.S. Army Air Corps program begun in 1941 to train African Americans to fly combat aircraft. The Airmen flew bomber escorts as the 332nd Fighter Group and became one of the most highly respected fighter groups of World War II. Their efforts paved the way toward the integration of all U.S. military forces in 1948. Benjamin Oliver Davis, Jr. (1912-2002) was among the first five African-American officers to earn their wings from the Tuskegee Army Airfield in 1942. He was the first black officer to solo an Army Air Corps aircraft and he went on to command the 332nd Fighter Group of the Tuskegee Airmen. Davis became the first African-American general in the U.S. Air force. Paul Tepper - Artist, "General Davis and his Redtails"